With the approval of Ministry of Education, the university now enjoys the autonomy to establish undergraduate programs and enroll through selection undergraduate students and students with special skills in arts and sports. There are now altogether 18 schools (departments) under the university, namely, Law School, Civil, Commercial and Economical Law School, International Law School, College of Criminal Justice, Politics and the Public Administration School, Business School, Humanism School, School of Foreign Languages, School of Continuing Education, College of International Studies, School of Marxism, School of Sociology, School of Master of Law, School of American and Comparative Law, School of German and Comparative Law, School of International Confucianism, Department of Physical Education and Department of Science and Technology. Over 20000 students are currently studying in CUPL with a teaching staff of more than 1690, including about 830 full-time teachers which include 510 professors/associate professors, 126 doctorate advisors and 420 master advisors. It is notable that the teaching and research areas of its legal faculty cover almost all the second-class disciplines of law. 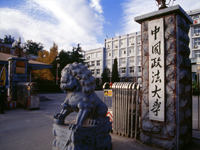 China University of Political Science and Law is a center for fostering high-quality talents in political science and law. In the past 50 years, it has provided the society with more than 200 thousand political and legal talents of high quality, most of whom have become the mainstay in the nation's organs in public security, prosecution, judiciary, justice, government, economic entities as well as in legal education and research. College of International Student is in charge of education administration for foreign students. The University offers foreign students such degrees as Bachelor degree, Master degree programs. CUPL offers foreign students with undergraduate, master, doctorate degree programs. Undergraduate Programs provide 16 majors, which include Law, Sociology, Administrative Management, International Political Science, Political Science and Administration, Public Affairs Management, Business Management, Economics, International Commerce, Philosophy, Legal Journalism, Chinese Language, English, German, and so on. Master Programs comprise 34 majors, which are Legal Theory, Legal History, Constitution and Administrative Law, Criminal Law, Civil and Commercial Law, Procedure Law, Economic Law, Political Science Theory, Chinese and Foreign Political System, International Relation, Administrative Management, Political and Economy, Enterprise Management, Law and Economy, Logics, Comparative Law, Applied Psychology, Chinese Philosophy, Foreign Philosophy, Economy History, International Economy, Industrial Economy, Human Rights, Evidence Law, Legal Language, International Politics, Sociology, English Language and Culture, Journalism, Chinese Modern and Contemporary History and Accounting. Doctorate Programs cover 16 research areas, which include Legal Theory, Legal History, Constitution and Administrative Law, Criminal Law, Civil and Commercial Law, Procedure Law, Economic Law, Environment and Resource Economy, Comparative Law, International Economy, Human Rights, Evidence Law and Chinese and Foreign Political System.